Beginning in 1874, from a perch high above the Atlantic, the Wentworth has welcomed guests with classic New England hospitality. 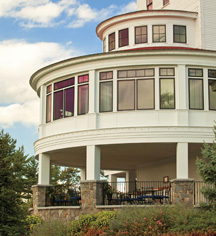 Once the largest wooden structure on the New Hampshire coast, this "Grand Dame by the Sea" was a hub for social, business and political luminaries from around the world. The famed "Ship Building," modeled after the elegant ocean liners of the day, was exceptionally popular and offered stunning ocean views. In 1905 the hotel hosted the signers of the Portsmouth Peace Treaty, which ended the Russo-Japanese War and garnered President Theodore Roosevelt the Nobel Peace Prize. In the 1980s the hotel fell into disrepair and was threatened with demolition. In 1996 the desperate state of Wentworth was confirmed: it was the first hotel to be featured on the National Trust for Historic Preservation's list of 11 Most-Endangered Places. Thanks to efforts of a coalition of preservationists, community supporters and the non-profit Friends of the Wentworth, the hotel was saved from the wrecking ball and it continues to excel into the 21st century. 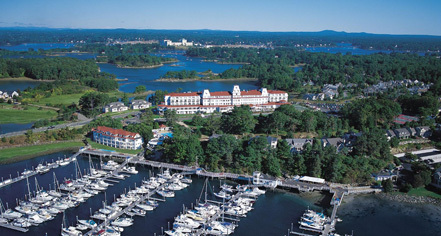 Read more about the history of Wentworth By The Sea, as told by Historic Hotels of America 2014 and 2015 Historian of the Year Stanley Turkel. Excerpt is taken from his latest book Built to Last: 100+ Year-Old Hotels East of the Mississippi (AuthorHouse 2013).